Hi. 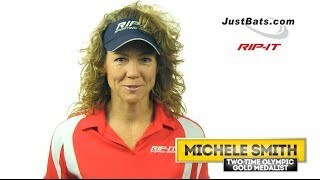 I'm Carie Dever-Boaz, and I'm here with JustBats.com. I've coached at the college level for over 16 years, in the travel ball, high school, just about anything, even the Pro League. And the slapping is something that is everything coaches want. It's speed, it's offense, and it's gonna put multiple runs on there if you have people that can hit behind 'em. We've talked about the progression of the footwork of slapping and where we want the barrel of the bat to go. But now we got to talk about the technology of these bats. These bats are becoming so hot with such a great sweet spot that now we have to teach our slappers how to not use the sweet spot in playing the short game. We're trying to basically exploit the defense's weakness or their fear of getting to close from getting hit with the technology of the bat that we can kill the ball. Remember, no matter how good a slapper you are, how good your technique is, if I'm gonna bunt that ball in that sweet spot, it's gonna go. That's the way these bats are designed. So we all have to teach our batters how to use that last inch of the bat. And yeah, I said the last inch. And it's gonna take somebody who's incredibly athletic, who can really learn how to mishit that ball. 'Cause we're looking at hitting the ball on that last inch of the bat and killing it wherever we want it on the field, be it at, first, the pitcher, or third. We're looking at killing that ball right in there. So the way we do this with the slappers is we're gonna go through a progression that all they do is get pitches thrown at 'em. And they are literally looking at trying to miss the ball. And I did say miss. And this is a drill that they're trying to miss it within an inch of the bat. Some are gonna get far. As they get better and better and better, sometimes they might even tick the ball. Don't panic. If they're ticking the ball, they're getting close as they possibly can. Once they get really good at that –and videotaping your athletes during this can help 'cause you can actually freeze frame it to see how close they're actually getting. They're gonna start learning true bat control. All right? After we do that, we'll go into the very new drill where they actually hit it right there. One of the things I want to point out that we've started doing –and I believe Natasha Watley was the one that shared all this with everybody, and now we're just passing it along –is when you drop your hands and that top hand goes to the top of that barrel where we're looking at bunting, if you see my finger right here, my index finger, it's actually gonna extend and be on the top side of the bat. Because I'm gonna take that finger and basically point it where I want that ball to go. So as I set myself up, I'm going through my footwork, the bat's dropping, finger's there. And I'm kinda gonna direct that ball and kill it where I want it. The first drill we're gonna do for you, right now we're gonna show you how we're gonna go through. The whole goal is to miss that ball by as close as you possibly can. Give 'em a target of an inch and see how well they do. All right. Here we go. And I tipped it. Let's do that again. And it really doesn't matter where that pitch is thrown. We want it thrown. And we have to have bat control. If it's in, the hands move. If it's high, we're going here. We're working on our control. We're going again. Boom. That's what we're looking for. We're looking at missing that ball. All right. We just spent time practicing on missing the ball by an inch. Let's go to the second progression of this drill. They've gotten good at it. They're getting as close as they possibly can. You feel pretty comfortable with it. Now we're gonna focus on using this last inch of that bat to hit the ball in fair territory based on where we are. Remember, focus on that index finger pulling that ball down where you want it. Once again, mishit the ball, last inch. Avoid the technology in the sweet spot of the bat that you're using. If you notice, you'll almost here kind of a funny sound. Bunk. Bunk. Once again, as slappers, we're looking at mishitting and controlling that last inch with that index finger coming down so that we can control. Hit it two feet, three feet, four feet, anywhere we want, and exploit the defense. Thanks.